Think you think as well as you can? Think again. Regardless of your basic equipment you can learn to think better — more productively, more creatively, more effectively. 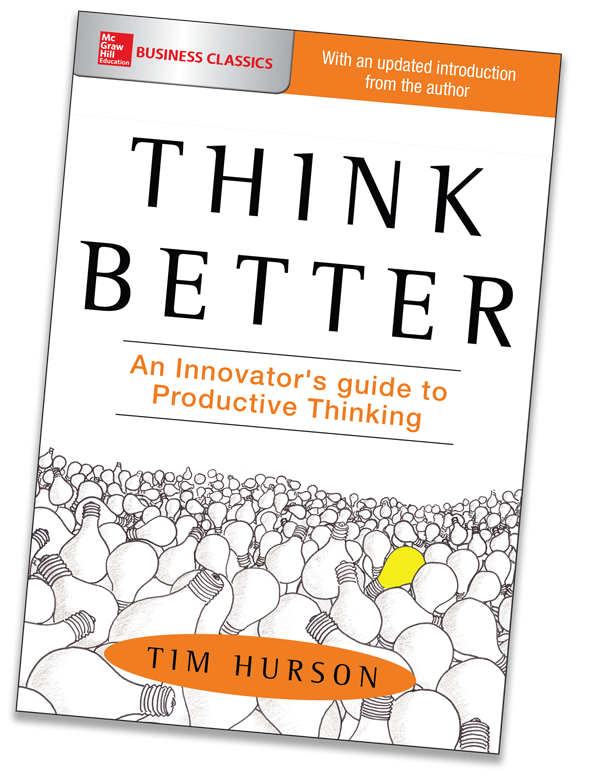 Based on Tim Hurson’s acclaimed corporate innovation seminars, Think Better shows you a proven, repeatable process that will help you have more ideas, better ideas, more of the time. Tim Hurson’s Productive Thinking model has helped thousands of people in Fortune 500 and FTSE 100 corporations around the world think more creatively, more innovatively, and more productively. Learn the real secret of the great minds in history — that productive thinking is a skill that can be learned and developed. There are hundreds of books on thinking or creativity or innovation. Just about every business book, self-help book, pop psych book, and leadership book ever written mentions the importance of thinking better. But there are very few books that provide clear how-to information that can actually help you Think Better. Think Better is about Productive Thinking — why it’s important, how it works, and how to use it at work, at home, and at play. Productive Thinking is a simple but powerful approach to thinking better. It helps people understand more clearly, think more creatively, and plan more effectively. It’s straightforward to learn, practical to implement, and it works. Productive Thinking is a game changer. Everybody talks about innovation these days, but very few actually know how to achieve it. Productive Thinking shines a bright light on the straightforward thinking strategies that creative geniuses have been using for centuries. Productive Thinking brings thinking better out of the closet and packages it in a way that makes it easy for you to grasp and use — so you can think better, work better, and do better in every aspect of your life. — Gail Vance Civille, Sensory Spectrum Inc. Better thinking means more success. The better you can think, the more successful you can be. Great companies are better because they have better ideas, better plans, and better execution. Great people are better because they can think more clearly and creatively about where they want to go and how to get there. All of us already have the ideas we need to succeed. They are inside us all the time. The trick is to capture them so that you can use them. Haven’t you had your best ideas in the shower or while driving or exercising or just daydreaming? Wouldn’t it be great to be able to capture those ideas and really put them to work? Think Better shows you how. Think Better shows you how you can start with an intractable technical problem, an unmet consumer need, or a gaping chasm in your business strategy and, by following a clearly defined, practical thinking process, arrive at a robust, innovative solution. Global companies use Hurson’s Productive Thinking Model to generate innovative solutions to complex business problems. Think Better shows you how to translate even the toughest personal or financial problems into powerful, practical solutions. In Step 1: What’s Going On? You’ll discover new ways to truly understand your issues and challenges so you can avoid the “Great Answer – Wrong Question trap that so many people and organizations fall into. You’ll learn a straightforward, unforgettable way to analyze every problem so you can really understand what’s making you itch and why, who else is involved, and what you need to know to move forward. In Step 2: What’s Success? You’ll learn the secret of visioning — imagining the future you want to see so you can determine clear, measurable goals and criteria for success. This is the step where you harness the power of dreams so you can establish what Hurson calls Future Pull. You will learn how to take a grappling hook and throw it into your desired future, so you can pull yourself toward it. This is where you overcome the gravitational pull of the past by painting a picture of a future so powerful and compelling that you it literally pulls you toward it. In Step 3: What’s the Question? you’ll learn how to effectively frame your challenge. Over and over we hear how questions are more important than answers. But how do you figure out the right questions to ask? In this step Hurson explains the power of Catalytic Questions — questions that if answered well open doorways to powerful, innovative solutions. Articulating the Catalytic Questions to your challenge is like finding that one thread in a knot that seems to loosen all the other threads and allows you to find a solution. In Step 4: Generate Answers you’ll learn why Brainstorming is like cholesterol. There’s good Brainstorming and bad Brainstorming. And most of us have experienced only the bad. Bad Brainstorming usually produces only a few ideas — and not very original ones at that. Good Brainstorming lets you get to what Hurson calls the Third Third — those answers that are full of creativity and promise, not just the same-old, same-old answers you’ve heard hundreds of times before. But answers that really do have to power to produce innovative results. In Step 5: Forge the Solution you’ll learn how to use one of the most exciting tools in the Productive Thinking Model. It’s called POWER, and it presents a whole new way of evaluating ideas — not just judging them as good or bad, acceptable or unacceptable, but actually improving them. POWER is a way to exercise what Hurson calls generative judgment — a way of evaluating ideas that actually makes them stronger, more robust, and more workable. You’ll see how you can transform what might at first seem like ho-hum ideas into a powerful, innovative solutions. With POWER you will have a tool that can truly turn good into great. In Step 6: Align Resources you’ll learn the simplest, fasted way to take your solutions and translate them into workable action plans. How many potentially great ideas never see the light of day because they seem too complicated, too impossible to even start? How often have your great ideas remained just that — great ideas. In this step Hurson introduces a practical approach to take ideas off the drawing board and make them into reality. You’ll be introduced to tools like EFFECT and The Great Wall of Time to help you understand, gather, and manage the resources you need to get the job done. Whether you’re working alone or in a team you need to marshall the resources to transform creative impulses into innovative slutions. Think Better shows you how. — Kobus Neethling PhD, President, South African Creativity Foundation; author of Author Am I Clever or Am I Stupid? It is quality of thinking that differentiates great companies and people from merely good ones. Hurson believes that most organizations have the ideas they need inside their own walls. And most people have great ideas inside their own heads. The trick is to get them out — and turn them into reality. Think Better shows how great companies and great individuals have succeeded by applying a set of easy-to-learn, practical principles that can actually raise the power of people’s thinking. By developing your Productive Thinking capacity you can generate more ideas, more innovative ideas, more workable ideas, and, ultimately, more success. Whether working alone or in teams, individuals will get better results in less time by developing their Productive Thinking skills. With Productive Thinking, individuals discover a new sense of freedom, confidence, and possibility, project teams perform at the highest level of productivity and creativity, and solutions are transformed from good to inspired. 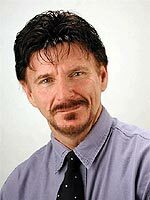 Click here to listen to a podcast interview with Brian Oates. More than anything, Productive Thinking is an attitude that will let you look at problems and convert them into opportunities. At the end of this disciplined brainstorming process, you’ll have a concrete action plan, complete with timelines and deadlines. We all know people about whom we say, wow he’s sharp, or she’s wise, or they so creative. Here’s the good news. Anyone can learn how to think better. Thinking skills are not innate. It’s not: Either you have them or you don’t. Anyone can learn to think better. And it’s not even that hard. It’s just that until relatively recently we didn’t understand what made some people seem to be smarter or more creative than others. Most of the people we admire for their creativity or their wisdom or their understanding discover these secrets by accident. In fact, they don’t even know what it is they are doing. But cognitive research is clear that you can learn how to think better, and the principles of doing so are pretty simple. To create the future, you first must be able to imagine it. Productive Thinking is a way to help you do that. Click here to listen to a podcast of Gregg Fraley interviewing Tim Hurson. The feedback on your presentation was incredible...and you were right...constant comments that your speech wasn't long enough... Well done.